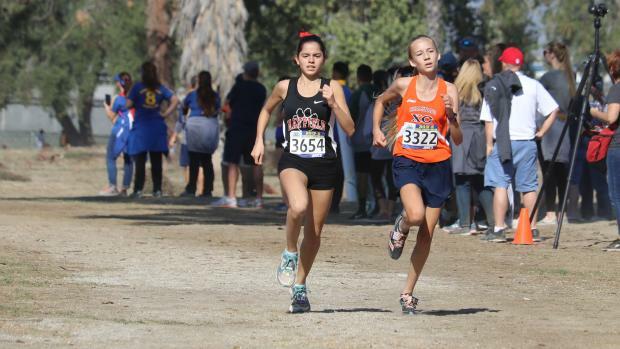 RIVERSIDE -- Senior Mikaela Ramirez of Ayala and senior Cy Chittenden of Mira Costa took advantage of a nearly wind-less warm dry Saturday morning to run fast times on the Riverside City Championship Course on Day 2 of the CIF-Southern Section Preliminaries. 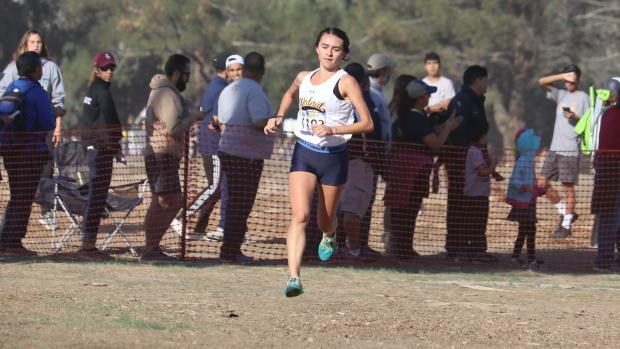 Ramirez's time over the mostly flat three-mile dirt layout of 17 minutes, 13.5 seconds was the fastest among 11 girls races across five divisions over two days. Her effort came in the second of three heats of Division 1. Chittenden also put up the fastest boys time of the two-day championship-meet qualifier, running 15:02.3 to win Saturday's second Division 1 heat. Chittenden's time was the best of 12 heats over two days, including that of defending Division 3 champion Kevin Ramos of Rubidoux, who ran an easy 15:02.9 on Friday, a day where racing was affected by heavily gusting Santa Ana winds. 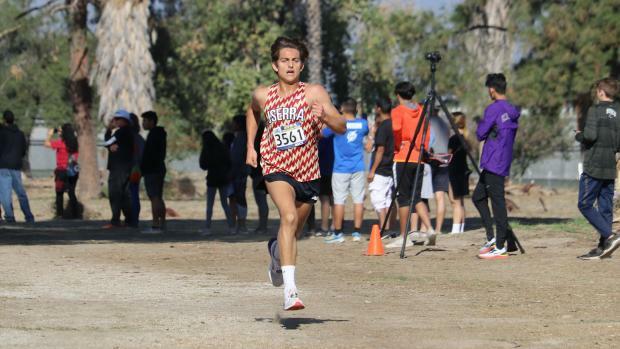 The two-day meet served to qualify teams and athletes into the Nov. 17 CIF-SS Finals, which will be held on the same Riverside City three-mile course. The top 24 teams in each division advanced, as did individuals not associated with qualifying teams. Qualifying criteria for individuals: For divisions with three heats, individuals not on qualifying teams who placed among the top 10 overall advanced; for divisions with two heats, individuals not on qualifying teams who placed among the top 15 overall, advanced. Ramirez had help in her running her fast time, overcoming an aggressive early pace of Chaparral senior Cynthia Martin. It was Martin who went out fast early before Ramirez pulled her in. The two were then close throughout the rest of the race with Martin placing second in 17:17.4, the No. 2 time of the meet. San Clemente junior Hana Catsimanes was third in 17:23.5 (pictured left of Ramirez above). This was only the fifth race of the season for Ramirez, who was injured early in the season. She appears to be all the way back. She most recently won the Palomares League title and her 17:13 on Saturday on the Riverside layout is consistent with her previous best on that course: 17:13.80 for 8th place in the section final last year, and 17:13.40 in the section prelims as a sophomore. Walnut's Chloe Arriaga won Heat 1 in 17:19.4, the No. 3 time of the meet. 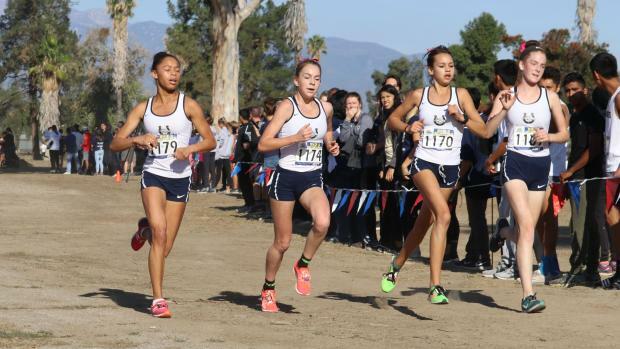 The UC Davis-bound senior pushed the pace early and maintained the lead throughout despite a consistent challenge from Chino Hills sophomore Jacqueline Duarte (17:26.2). Chloe Arriaga is a two-time section champion who was second last year to Great Oak's Fatima Cortes. Emma Arriaga was third in 17:38.0, as Walnut had the top team qualifying (second overall in the Division 1 merge). 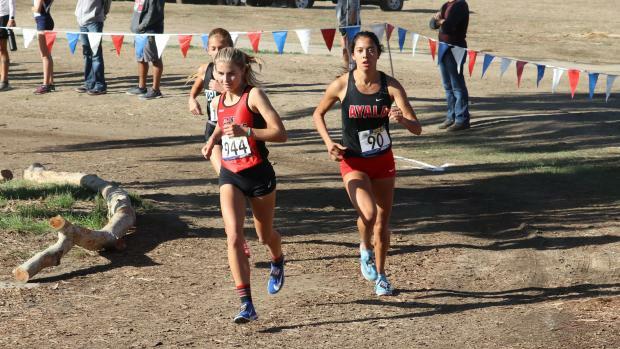 Great Oak, the top-ranked girls team in the state and one of the nation's elites, ran its B team and still qualified second behind Walnut in the heat and third overall in the merge behind league rival Vista Murrieta. Junior Kendall Harrison was Great Oak's top finisher, placing 12th in Heat 1 (18:11.5), with fellow juniors Isabelle Buncab (18:12.1) and Ivey Johnson (18:18.4) just behind in 14th and 15th, respectively. Vista Murrieta, running in Heat 2, was textbook in qualifying, scoring 66 points by placing all five runners in places 12 through 16! In order: freshman Devyn Candaele (18:16.1), sophomore Aniya Pretlow (18:16.2), sophomore Emily Bourque (18:16.2), senior Paige Haynes (18:16.3), and junior Makayla Fick (18:23.5). Fick needed a late surge in the final 100 meters or so to make it a perfect five. This was Fick's first competitive race of the season. Note that Mira Costa freshman Dalia Frias won the Division 1, Heat 3 race (17:32.4). In a two-day meet where sophomores crossed the line more than any other class, Frias was one of only two in the Class of 2022 to win a heat. The other was Sierra Canyon frosh Isis Diaz, who won Heat 2 of Division 5 -- the last race of the meet -- in 18:22.9. Frias' time is No. 6 overall in the D1 merge. 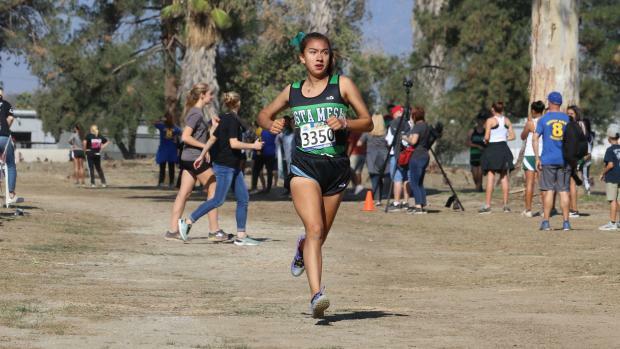 Costa Mesa junior Diane Molina was the class of a top-heavy Heat 1 field, winning in 17:26.1. She had plenty of talent pushing her: Stellar Harvard Westlake sisters, Natalia and Daniela Quintero, and -- AND -- super Mayfield sophomore Audrey Suarez, among others. Natalia Quintero, a sophomore, placed 2nd (18:03.8), nearly 38 seconds behind Molina. Freshman Daniela Quintero crossed in 18:03.9. Note that Molina was the only junior winner among the 11 preliminary heats for girls. In leading Harvard Westlake to the top team qualifying spot in the division, the Quintero sisters were in stride down the stretch, seemingly not so concerned with Molina in a qualifying exercise. Suarez, a state 1600 meter medalist on the track as a freshman, needed to tap into her closing reserves at the end to fend off the unrelenting challenge of Chaminade freshman Maddie Gutshall. Suarez crossed just .01 in front in 18:15.9. Senior Hannah Konkel (18:22.8) won Heat 2 and led Laguna Beach to the top team qualifying spot in the heat with JSerra just two points behind. Senior Nadia Tabrizi was second in the heat (18:27.5) in leading JSerra. Note that Suarez, Molina and Tabrizi placed 2-5-7 at last year's D4 final, won by Claudia Lane. 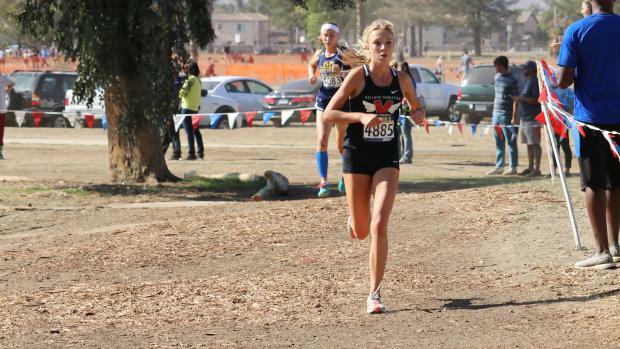 As a freshman, Mia Barnett won the CIF-SS title on this same course. Using Saturday as a tune-up for next week's title defense, Barnett met an early challenge from Elizabeth Radmilovich, a senior from Santa Ana Calvary Chapel, found rhythm with her long strides, and cruised in at 18:37.5 to win Heat 1. (Barnett is one of five sophomores to have won a heat at the prelims.) Radmilovich was second in 18:42.7 with Mammoth junior Jordyn Harper third (19:18.6) and Xavier Prep sophomore Molly May fourth in 19:34.6. Pushing Diaz in Heat 2 was Haley Allen, a senior from Flintridge Prep, who was second in 18:34.5. Webb sophomore Lily Miller was third in 18:48.3. Diaz and Allen had the division's top two times in the merge, ahead of Barnett and Radmilovich, with Miller fifth. Caroline Wreszin (20:47.5) slotting in the 2-5-6-10-19 finish. 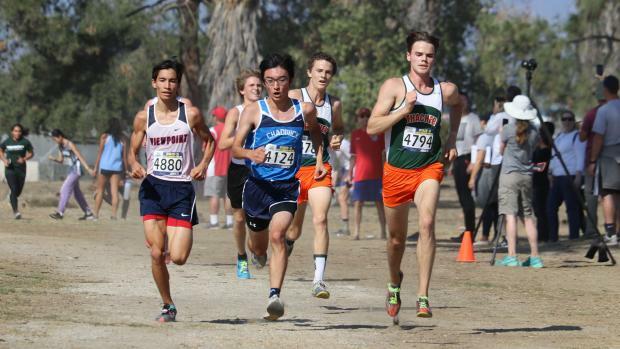 Chittenden, running in Heat 2 of 3, had to hold off a pack that included Valley View senior Lorenzo Orozco (15:06.7), Ayala senior Andrew Martinez (15:08.3), Santa Ana senior Diego Duran (15:10.6) and Chino Hills senior Jake Bergmann (15:11.8). In the first heat, it was Tesoro senior Bryson Crites out-sprinting Great Oak junior Cole Sawires Yager over the final 100 meters or so to cross in 15:03.0, the third-fastest boys time of the meet. Sawires Yager was a stride back in 15:03.7 with Highland sophomore Daniel Rodriguez just behind (15:04.0). 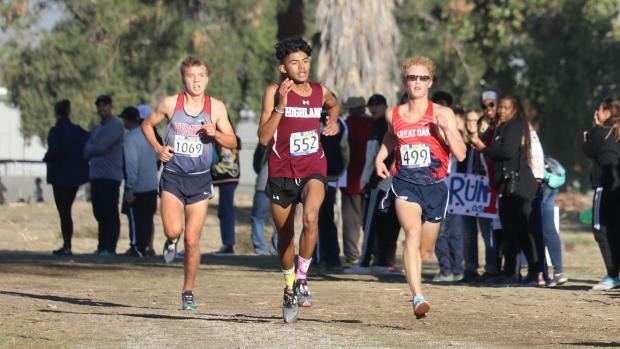 Sawires Yager, who ran strong at the Apache Invitational and won the Southwestern League title, added to his pitch for Great Oak's top seven. The Wolfpack boys, one of the nation's elites, ran B teamers, yet still qualified atop the division with junior Leandro Candray placing fourth in the heat (15:17.0), and senior Ryan Shields (15:25.6), junior Cameron Hylton (15:25.9) and sophomore John Worthy (15:36.2) going 10-11-19 for 46 points. Trabuco Hills senior Josh O'Neill won Heat 3 in 15:08.6 with Aliso Niguel junior Ben McKenna next in 15:10.9. JSerra junior Anthony Grover, the defending section and state champion, was cruising along in the pack of Heat 2. And then he was in overdrive, cranking out a fast final mile that propelled him to the front. He crossed alone in 15:25.4 with senior teammate Peter Herold next in 15:32.9. That's the same order as last year's D4 final, with the teammates going 1-4 at State. Head coach Marty Dugard explained that the plan was to 'tempo' the first two miles at 5:20 and then let loose. Grover's split were 5:20-5:20-4:45 with Herold coming through that last mile at 4:53! Harvard Westlake senior Andrew Shibuya won the first heat (15:39.2) with Costa Mesa senior Kevin Cortez (15:41.5) and Covina senior Daniel Hernandez (15:42.2) crossing next. Defending section champion Cathedral was a narrow second to JSerra in merged results. Junior Tyriq Granillo crossed in 15:34.8, as the top runner for Cathedral. Heavy favorites to capture next week's title, Laguna Beach, all crossed in a pack within four seconds of one another. Heat winners were Shane Lintereur (Trinity Classical) in 16:10.8, Wyatt Sarkisian (Brentwood) in 16:22.3 and senior Nick Montijo (Providence) in 15:53.3. Defending division champion Thacher put up the top qualifying team total led by senior Ford Shaper (15:56.1) and junior Winslow Atkeson (15:58.2). Shaper was fifth in last year's final and is the top returning finisher from that race.